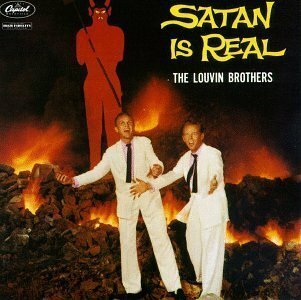 The first image on the page is for Louvin Brothers - Satan is Real, followed by the original. Also check out the most recent parody covers submitted to the site. I'll be dancin' to (Well, if a comet or such does not hit) Beatlemania Magic and The Rusty Haywackers tonight. Shook me ancient ape arse to a wonderful Clapton tribute band last night. BTW Satan as well as God, IF real, are both totally meaningless.